We can stop it. In this five minute video I share a few tips for how to stop this craziness and waste less time and money in unproductive recurring staff meetings. I’m sure that you have meetings where they are recurring, maybe they’re already on the schedule for all of the next six months. Every month you have a meeting with the same group of people. If it’s anything like some of the meetings I’ve attended, you show up at the meeting and everyone tries to remember what you talked about at the last meeting. People ask questions like, “Oh, weren’t you gonna bring that thing that we were supposed to talk about at this meeting?”. You spend half of the meeting just figuring out why you’re there, and what you’re supposed to talk about and then the other half of the meeting realizing that the work you actually need to do you can’t do because you need somebody who’s not in the room to be part of the conversation. So then the second half of the meeting is just, “Oh, how are we gonna find out from this person what the deadline is for that?”. Then you leave the meeting by setting the date for the next meeting without actually having achieved anything. This is a cycle that I would love to break. I feel like it is one of the most critical things that we should look at, because it’s not just about the meeting, it’s about the fact that it shows a level of disrespect for people’s time. It starts to erode the sense of team and what you’re there to do. People can start to have really negative behaviors that they get into because they dread going to those meetings; They feel so deflated after attending a meeting that was completely unproductive and a waste of their time. You know this has already started when people start to have meetings after the meeting just to talk about how bad the meeting was. We’ve got to get out of this. How do you get out of it? First, one basic step that you can do in the next month is to write a purpose statement and an agenda for any meeting that you are in control of. If you are leading a meeting, What is it about? Why… What is the purpose? Why are you there? If you find yourself writing a purpose statement and you actually aren’t sure what the purpose of that meeting is, I implore you to have the courage to ask those questions. Do we need to meet? What is it we’re hoping to accomplish? Maybe we do need to meet, but maybe we don’t need an hour, maybe we can just get together for 15 minutes, do a standing meeting and get this thing decided really fast and move on. Maybe once you’re clear about the purpose for your meeting you will also be clear about who needs to attend. I remember being a part of a leadership development program, and one of the exciting things that we were going to get to do as part of this leadership development was to shadow a high-level leader in the organization. The leader I was matched with, who was a high-level leader in our organization, who I didn’t really know very well, she invited me to come with her to a meeting. I attended this meeting with her. It was between a software company that was providing an enterprise solution to the organization and some high-level leaders in the organization. It was basically a boring sales pitch. I just sat there looking around the room. I was adding up the salaries of the people in that room. It was an hour-long meeting and I thought, “This is crazy.” It was amazing the people that were in that room and how little their time was being valued at that moment. With this, my other question to you as you think about using people’s time more productively is, “What is it you’re going to do at that moment that really takes advantage of the fact that you are live human beings who are interacting with one another?”. How do you make the most of having live humans interacting together? A lot of this has to do with finding those points of human connection. If you’re allowing space for actual dialogue, for an exercise to happen, or giving people a chance to connect with one another on a human level in a way that they can’t do if they’re just reading your email. So what can you do during your next meeting that will take the greatest possible advantage of the fact that you’ve got people there, real human beings, live human beings who are actually coming to your meeting? During your planning think to yourself, “Could this have been done in an email, or could it have been done in a broadcast?” If so, then rethink your meeting strategy. 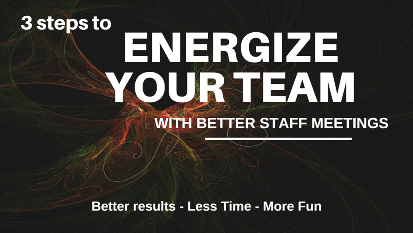 If you are interested in learning more about how to energize your team through more productive staff meetings, get my free toolkit below. Previous Post: « #33 How Do You Build a Business That Builds Community?